Background: Homecare for chronic obstructive pulmonary disease (COPD) has had mixed results depending on the setting and model applied. Aim: To see if a specialist team, working in the community under clinical supervision by secondary care respiratory consultants, impact on COPD admissions. Setting: Two UK district general hospitals serving a semi-rural population of 190 000. Personnel: Two nurses and a respiratory physiotherapist, employed by the local health board (PCT) and coordinated by a manager whose background is specialist respiratory nursing. Each covers a geographical area of our county. Criteria: They accept referrals from primary and secondary care if a COPD diagnosis is confirmed by spirometry, patients are on optimal therapy as per NICE guidelines but have any of: continued symptoms; recent admission from COPD; multiple exacerbations in the previous 12 months. Process: Referrals are prioritised and seen by the team within 1 to 28 days, but not out-of-hours. The team has weekly meetings with rotating respiratory consultants, supported by direct access to the multidisciplinary hospital respiratory team for clinical advice, medicines prescription and radiology. They provide home visits (a clinical assessment and basic observations) and can bring prescribed medication to homes to treat exacerbations promptly; they provide telephone contact, education on COPD for patients/carers/relatives, reiterating advice on self-management, exercise and pulmonary rehabilitation and liase with GPs and other community health professionals. LTOT, domiciliary NIV and pulmonary rehabilitation are available locally. Analysis: Retrospective review of admission data and clinical records. Results: Over the first year they received 204 referrals; 15 were rejected. There were no reported adverse clinical events and a 32% reduction in COPD admissions to hospital. The table illustrates the mean number (range) of admissions per (still living) patient over time. Conclusions: A sustained reduction in COPD admissions can be achieved in this setting, using a specialist respiratory team applying strict referral criteria, with close secondary care support. Background: Taunton Hospital Respiratory Early Discharge Scheme (THREADS) commenced in 2004 and has kept prospective data on exacerbating patients from the outset. During the lifetime of the team, several changes in chronic obstructive pulmonary disease (COPD) management have occurred, including COPD treatment guidelines developed by a local network, enhanced pulmonary rehabilitation and a community smoking cessation programme. Aims: To review prospective data collected on patients admitted to our hospital with COPD exacerbation to assess the possible impact of changes in COPD management over time. Method: We reviewed the GOLD1 staging of all patients admitted to Musgrove Park Hospital Taunton between January 2004 and June 2008 with an exacerbation of COPD. Results: A total of 805 patients with exacerbations were admitted over the 5 years. There was a reduction in admission rates each year from 248 (2004) to 116 (2007) (see table). There was a 9% (33%–22%) reduction in the proportion of patients admitted with moderate COPD but a 14% (60%–74%) increase in those admitted with severe COPD (see fig). Discussion: Recent data suggest COPD admissions are increasing both nationally (87 709 in 2002/3 to 100 441 in 2005/6) and in our strategic health authority.2 The THREADS team screen admissions to MAU carefully for the correct diagnosis and we suspect our data reflect a truer picture of COPD admissions in real time. The reason for our observation is unclear. Several initiatives in addition to THREADS have commenced locally over the past 4 years, including the wide dissemination of agreed guidance in using long-acting anticholinergics and combination inhalers and a primary care smoking cessation service. We suspect it is the totality of this activity that is now impacting upon the admission pattern to our unit. Conclusion: Emergency admissions to our hospital with exacerbations of COPD are reducing. 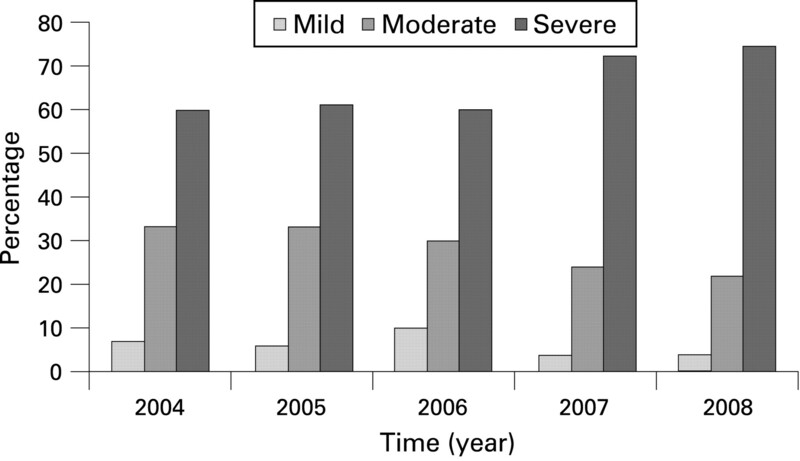 The ratio of severe to moderate disease appears to be increasing over time. It is unclear whether this is due to the impact of our nurse-led early discharge scheme or the totality of other locally implemented changes. Global initiative for chronic obstructive lung disease. Global strategy for the diagnosis, management and prevention of COPD. AJRCCM 2001;163. Background: Blood eosinopenia has long been known as a marker of acute infection and has recently been shown to be a better predictor of sepsis than C-reactive protein in critically ill patients.1 This study examines the usefulness of eosinopenia (£0.04), for predicting the severity of exacerbations of chronic obstructive pulmonary disease (COPD) using inpatient mortality and length of stay as markers of severity. Methods: Retrospective review of the case notes of a random selection of patients admitted with an exacerbation of COPD from March 2007 to April 2008. Patients with radiographic evidence of pneumonia and those having steroids in the previous week were excluded. Data were collected for: age, length of stay, FEV1, pH, white cell count (WCC) and mortality. Results: 83 patients were included in the study. 8/83 (10%) were excluded as they had been on steroids and 9/83 (11%) due to pneumonia. Median (range) length of stay in hospital was significantly increased in those patients who had an eosinopenia compared with those who did not (8 days (range 2–61) vs 5 days (range 1–27); p = 0.04). Mortality was also significantly increased in patients with an eosinopenia 4/23 (17.4%) versus 1/42 (2.4%; p<0.05). There was no significant difference between the mean pH on admission of the two groups: 7.41 (SD 0.06) eosinopenia group versus 7.42 (SD 0.09) in the patients with normal eosinophil count (p = 0.27). There was also no significant difference in the mean WCC between the two groups 14.1 (SD 4.01) in the eosinopenia group versus 12.5 (SD 4.01) in the other group (p = 0.18). Conclusion: The eosinophil count maybe a useful marker of severity in patients admitted with an exacerbation of COPD independent of the WCC and pH. As it is routinely given in the full blood count in all patients admitted to hospital there is no extra cost for this beneficial test. Khalid Abidi, et al. Eosinopenia is a reliable marker of sepsis on admission to medical intensive care units. Crit Care 2008;12:R59. Rapid readmission to hospital following an exacerbation of chronic obstructive pulmonary disease (COPD) is common, approximately 30% at 3 months. Physiological measures of disease severity did not predict readmission in earlier studies. We set out to study if measures of nutrition would better predict rapid readmission, as a previous study has shown that admissions are related to body mass index (BMI).1 Fifty-two patients admitted with an exacerbation of COPD were prospectively studied at the point of discharge. Nutritional and physiological data were collected and any subsequent readmission documented. Nineteen patients were readmitted within 3 months and these were compared with the 33 patients who were not readmitted. Readmitted patients were significantly older 73 (6.4) versus 66 (9), p = 0.043, but there were no significant differences in physiological measures. Nutritional measures used were albumin, BMI and mid-arm circumference (MAC). Mean albumin levels were not significantly different from each other 37 (7.5) versus 39 (4), p = 0.2; however, both MAC 23.7 (5) versus 27 (4) and BMI 22.5 (7) versus 25 (5) were significantly different, p = 0.016 and p = 0.046, respectively. In conclusion the lack of a difference in the mean albumin may be due to the fact that albumin acts as a reverse acute phase protein as well as a marker of nutritional status. The differences in BMI and MAC between the groups suggests that nutritional status is important not just in the admission of patients with COPD as shown before but also in those who are rapidly readmitted following discharge (see table). Background: Chronic obstructive pulmonary disease (COPD) exacerbations are modulated by the nature of the infecting organism.1 Lower airway bacterial pathogens are also commonly found in the stable state but the relationship between the different colonising organisms and the subsequent exacerbation has not been clarified. We examined how the three principal species of colonising bacteria affect exacerbation frequency using time to exacerbation as a surrogate marker. Methods: Between November 2005 and April 2008, patients in the London cohort with moderate to severe COPD who were colonised (>105 cfu/ml) at a stable state visit (no exacerbation within the preceding 5 weeks) were followed up until their next exacerbation. Subjects completed daily diary cards and exacerbations were defined as an increase in two respiratory symptoms, including at least one major symptom for 48 h. Repeated measures were allowed when there was subsequent stable state colonisation. The study endpoint was the time to next exacerbation. When no exacerbation occurred then the time to the last routine visit was recorded. Spontaneous sputum was collected and subjects stratified according to whether they were colonised by Haemophilus influenzae (HI), Moraxella catarrhalis (MC) or Streptococcus pneumoniae (SP) as measured by microbiological culture. If any other organism was present or if they were colonised by more than one of the above then the subject was excluded. Results: There were 39 baseline visits and 30 exacerbations from 27 subjects when there was colonisation by either HI (64%), MC (23%) or SP (13%). Mean age 71.6 years (SD 6.3), FEV1% predicted 38.8% (10.9) and median time to exacerbation or study end was 89 days (interquartile range 49–238). The median time to next exacerbation or study end (see table) was similar in each group: HI versus MC, hazard ratio (HR) 1.43 (95% CI 0.52 to 3.94, Cox regression p = 0.49); HI versus SP, HR 1.17 (0.77 to 1.79, p = 0.47); MC versus SP, HR 0.74 (0.24 to 2.28, p = 0.60). Conclusion: The time to next exacerbation is not affected by whether the subject is colonised by HI, MC or SP in the stable state. Wilkinson TM, Hurst JR, Perera WR, et al. Effect of interactions between lower airway bacterial and rhinoviral infection in exacerbations of COPD. Chest 2006;129:31724. Background: Exacerbations of chronic obstructive pulmonary disease (COPD) are important therapeutic outcomes and knowledge of exacerbation frequency is important for stratification on to clinical trials. We investigated whether a patient’s recall of their exacerbations in the previous year was related to the number of exacerbations they would have in the following year. Methods: Patients were asked to recall their exacerbations in the preceding year at the time of recruitment to the London cohort. After one year of participation in the cohort, daily diary cards were collected and we counted the number of exacerbations each patient had over that year. Our definition of an exacerbation using the diary cards was the presence of two major symptoms or one major and one minor for more than 2 days (major symptoms: increased dyspnoea, sputum volume or sputum purulence; minor: cold, wheeze, cough, sore throat, or fever) or if in the opinion of the clinician the patient had an exacerbation. Frequent exacerbators were defined as patients having three or more exacerbations per year, and infrequent exacerbators less than three. We studied 58 patients; mean age 71.8 years (SD 8.1), FEV1 1.1 litres (0.5), FEV1 % predicted 46.6% (17.3) smoking history 49.6 pack years (40.2). Results: There was no significant difference between the number of exacerbations patients recalled prior to recruitment and the actual number they recorded on diary cards in their first year of the study; mean 1.8 (1.8) and 2.1 (2.0) and median 1.0 (interquartile range 0–2.25) and 2.0 (0–3.25), respectively; Wilcoxon p = 0.24. 12 out of 19 frequent exacerbators correctly perceived themselves to be frequent exacerbators (sensitivity 85.7%) and 37 out of 39 infrequent exacerbators correctly classified themselves as infrequent (specificity 84.1%). Conclusions: We have shown that patient recall of their exacerbation frequency can be used to stratify patients as frequent or infrequent exacerbators in subsequent years. This may have implications for recruitment into clinical trials. Funding: This abstract was funded by NIH RO1 HL082578. It is recognised that hospitalisation due to a chronic obstructive pulmonary disease (COPD) exacerbation is associated with increased mortality and readmission rates post-discharge (Groenewegen et al. Chest 2003). Celli et al have used the BODE index (N Engl J Med 2004) to predict the risk of death in stable COPD. We wished to determine whether the BODE index and its components predicted mortality or readmission at 12 months in a group of patients hospitalised for a COPD exacerbation. 107 patients hospitalised for a COPD exacerbation who survived to hospital discharge were recruited into a case management study: mean age (SD) 70.8 years (8.1), FEV1 0.94 litres (0.33), 40% (15.6) predicted, 55 female. Body mass index (BMI), spirometry, MRC dyspnoea score and 6-minute walk (6MW) were measured at discharge, along with St George’s respiratory questionnaire (SGRQ) and London chest activity of daily living questionnaire (LCADL). Patients were followed up for 12 months. Over the 12 months, 18 (17%) patients died and 78 (73%) were readmitted. BMI was the only predictor of mortality (alive 24.5, died 21.5, p = 0.03). Predictors of readmission were MRC score, 6MW, BODE index, SGRQtotal and LCADLtotal. In this population the BODE index score did not predict mortality at 12 months, although its BMI component did. In contrast, BODE (including the dyspnoea and exercise component) did predict readmission at 12 months, possibly reflecting the relationship of these measurements to health status and functional disability, which also predicted readmission risk. In patients admitted to hospital with an acute exacerbation of chronic obstructive pulmonary disease (COPD), rapid readmission is common and problematical. Previous studies have shown that physiological factors do not predict readmission, but a measure of quality of life (St George’s respiratory questionnaire) does.1 We therefore set out to examine if a number of validated psychological measures are better associated with readmission. Fifty-two patients admitted with an exacerbation of COPD were prospectively studied at the point of discharge following an exacerbation of COPD. Physiological and psychological data were collected and readmission in the next 3 months studied by use of hospital records and contact with the GP. Data were analysed using Mann–Whitney and χ2 for categorical data. Nineteen patients were readmitted within 3 months and 33 were not. Readmitted patients were significantly older 73 (6.4) versus 66 (9) years, p = 0.04, but there was no difference in the physiological measures between the two groups (see table). Psychological measures including hospital anxiety and depression score 16 (7) versus 15 (7.4), social support scale 2.7 (0.6) versus 2.8 (0.6), London chest activity of daily living score 38 (16) versus 35.7 (12.3), illness perception questionnaire (symptoms, timing, severity and control subsets), family APGAR 8.7 (2.3) versus 7.7 (3.3) were similar in both groups of patients, p>0.2 in all cases. The only psychological factor that came close to significance was optimism (life orientation test) 14.6 (4.6) versus 12 (5.3), p = 0.08, higher scores denoting pessimism. This study suggests that neither the physiological nor the psychological measures we used predict readmission; it may be that measures of self-management and knowledge might have been worth including in the study. Introduction and Objectives: Chronic obstructive pulmonary disease (COPD) is the fifth leading cause of death worldwide. With disease progression, exacerbations increase in frequency with associated recovery longevity. COPD exacerbation is diagnosed on the basis of history, examination and chest x ray (CXR). This is a prospective observational study of patients attending MAU with an acute exacerbation of COPD in one trust over a 6-month period. The aims are to determine if correlation in CXR interpretation by clinicians compared with radiologists occurs and to assess any impact on clinical decision and management with regard to the initiation of empirical antibiotics. Methods: Data were collected on all patients presenting to MAU with an acute exacerbation of COPD over a 6-month period. We compared CXR findings of clinicians from medical case notes with those of radiologists on PACS. We identified the proportion of patients started on empirical antibiotics and compared this with those correctly identified as having evidence of true infective exacerbations by the presence of radiological pneumonia to determine any discrepancies. Results: Mean age for the 45 successive patients identified with an acute exacerbation of COPD was 71.8 years (range 46–91). Discrepancies were noted in 17.8% of patients who were treated with antibiotics for a presumed pneumonia-related exacerbation by clinicians in which radiologists reported no radiological evidence of infection. However, 13.3% of these were perceived to have a true infective exacerbation based on clinical and laboratory findings according to BTS guidelines. Furthermore, 4.5% of patients with definite radiological evidence of infection were not given antibiotics based on clinicians’ CXR interpretation. Radiological evidence did not make any difference in antibiotic prescribing. Adverse effects were noted in 4.5% of patients with half developing Clostridium difficile. Conclusions and Recommendations: Considerable variability between clinician and radiologist reporting of CXR interpretation in these patients was noted. It is important to have a consensus with regard to clinical decision-making and the management of these patients. Recommendations include a facility for rapid radiological opinion to reduce the threshold for inappropriate antibiotic use. Background: End-of-life care pathways (EOLCP) are used increasingly for patients dying from end-stage chronic obstructive pulmonary disease (COPD). However, patients with COPD may experience many hospital admissions prior to death. There are no clear criteria defining the point at which the EOLCP should be implemented. Aim: The purpose of this study was to identify clinical and physiological parameters indicative of a terminal state in patients with COPD. Methods: This study was conducted at James Cook University Hospital (JCUH), Middlesbrough. Case records of the most recent 60 patients dying from COPD were identified. Clinical and physiological parameters including performance status (PS) and a composite score of bedside physiological measurements (early warning score, EWS) on final and penultimate admissions were compared. Comparison was made between EOLCP and non-EOLCP groups. Results: Mean age (range) 76 years (53–94), 60% female. 64% had one or more previous admissions for COPD in the preceding year. There was a bimodal distribution of deaths due to COPD. Early deaths (61%) occurred a median of 2 days (1–7) after admission, late deaths occurred 18 days (8–52) after admission. Do not resuscitate (DNAR) forms were completed in 13.8% on penultimate and 87% on final admission. The EOLCP was used in 25% of cases during final admission. Significant differences in PS and EWS between the final and penultimate admission were observed (see table). There were no differences between the EOLCP and non-EOLCP groups or between early and late deaths. Conclusion: End-stage COPD is associated with a marked decline in performance status and significant derangement of physiological parameters. DNAR orders are made in almost all patients dying from COPD but the EOLCP is used in an infrequently and ad-hoc manner. Patients dying from COPD may be identified by assessment of performance status and simple bedside physiological measurements. Introduction: Oxygen delivered (FiO2) in inappropriately high concentrations can worsen hypercapnia, causing acidosis in patients with chronic type 2 respiratory failure (T2RF) due to chronic obstructive pulmonary disease (COPD)/other causes. We introduced patient-specific protocols (PSP) to instruct ambulance staff about specific O2 requirements for known chronic T2RF patients during acute ambulance transfer to hospital and studied their use and effect on length of stay (LOS). Method: Patients with chronic T2RF, or acute T2RF when unwell, were given a PSP documenting FiO2 recommended to maintain SaO2 88–92%, with instructions if these parameters could not be achieved. PSP were agreed and co-signed by two respiratory consultants and the LAS medical director. Copies were held in notes, by patients and “flagged” by LAS to alert ambulance staff on call-outs. Ambulance FiO2 and oximetry, initial arterial blood gases, admissions and LOS were reviewed retrospectively for 12 months before and after PSP issue. Results: 20 patients (six men; 14 women; 19 COPD, one nocturnal hypoventilation; 13 (65%) on LTOT; mean ± SE age 71.9 ± 2.1 years, FEV1 0.68 ± 0.06l, MRC dyspnoea score 4.6 ± 0.1) received PSP (April–September 2006). They had 60 admissions (3.2 ± 0.4/patient, mean ± SE) in the year before PSP and 67 admissions (3.4 ± 0.4/patient) in the year after. Before PSP, ambulance FiO2 was >28% in 26% of transfers (10/39), but after PSP, occurred in 13% transfers (8/61, p = 0.06). Inappropriately high ambulance FiO2 resulting in SaO2 >92% occurred in 64% of transfers (16/25 transfers; data not recorded in 14) before PSP, but occurred significantly (p<0.001) less frequently after PSP (12/55 transfers (12.8%); data not recorded in four). There was no significant decrease in episodes of acute-on-chronic T2RF (5/41 (12%) before; 7/51 (14%) after PSP) or total LOS (mean ± SE 35.2 ± 7.1 days before; 35.3 ± 5.2 days after). Bicarbonate increased from mean ± SE 31.9 ± 0.7 mmol/l before PSP to 34.1 ± 1.0 mmol/l in the year after. 11/20 (55%) of the patients died during the year following the study, none related to acute hypoxia. Conclusion: Patients with chronic T2RF are at high risk of acute T2RF and death. Whereas PSP were effective in reducing inappropriately high FiO2 during ambulance transfer in susceptible patients with chronic T2RF, they had no effect on LOS, episodes of acute T2RF or serum bicarbonate, all of which reflect disease severity.